One of the many advantages of developing with NXP’s i.MX 8M Family of application processors is the ability to utilize both the Cortex-A53 as well as the Cortex-M4 core. As such, we have had questions about how to run FreeRTOS using the M4-Core of our Nitrogen8M SBC. This blog post will first present the architecture of the i.MX 8MQ processor as a starting point for the discussion, and then explain how to build and run the FreeRTOS SDK v2.3 on its MCU. 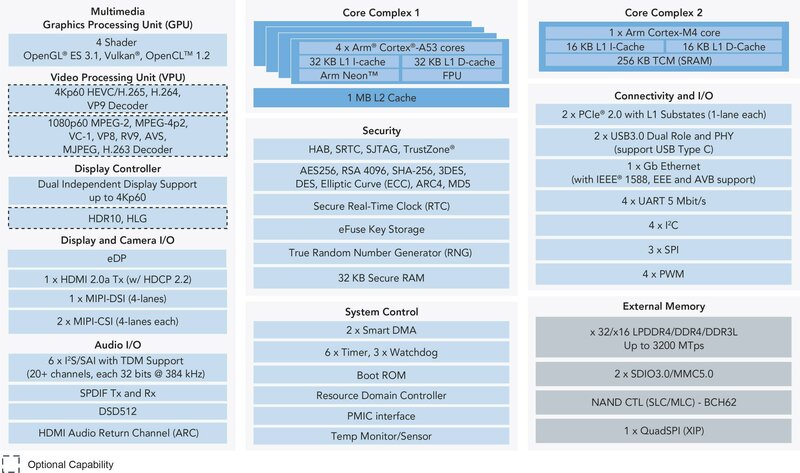 The i.MX 8M (Quad) processor is coupling a Cortex-A53 cluster (Core Complex 1, 1 to 4 cores) alongside a Cortex-M4 (Core Complex 2) to offer the best of MPU and MCU worlds. The i.MX8M processors offer an MCU and a MPU in the same chip, this is called a Heterogeneous Multicore Processing Architecture. The first thing to know is that one of the cores is the “master”, meaning that it is in charge to boot the other core which otherwise will stay in reset. The BootROM will always boot the Cortex-A core first. In this article, it is assumed that U-Boot is the bootloader used by your system. The reason is that U-Boot provides a bootaux command which allows to start the Cortex-M4. Once started, both CPU are on their own, executing different instructions at different speeds. Where is the code running from? It actually depends on the application linker script used. When GCC is linking your application into an ELF executable file, it needs to know the code location in memory. Note that the TCM is the preferred option when possible since it offers the best performances since it is an internal memory dedicated to the Cortex-M4. External memories, such as the DDR, offer more space but are also much slower to access. In this article, it is assumed that every application runs from the TCM. When is the MCU useful? The MCU is perfect for all the real-time tasks whereas the MPU can provide a great UI experience with non real-time OS such as GNU/Linux. We insist here on the fact that the Linux kernel is not real-time, not deterministic whereas FreeRTOS on Cortex-M4 is. Also, since its firmware is pretty small and fast to load, the MCU can be fully operating within a few hundred milliseconds whereas it usually takes Linux OS much longer to be operational. Since both cores can access the same peripherals, a mechanism has been created to avoid concurrent access, allowing to ensure a program’s behavior on one core does not depend on what is executed/accessed on the other core. This mechanism is the RDC, it can be used to grant peripheral and memory access permissions to each core. The examples and demo applications in the FreeRTOS BSP use RDC to allocate peripheral access permission. When running the ARM Cortex-A application with the FreeRTOS BSP example/demo, it is important to respect the reserved peripheral. The FreeRTOS BSP application has reserved peripherals that are used only by ARM Cortex-M4, and any access from ARM Cortex-A core on those peripherals may cause the program to hang. The ARM Cortex-M4 core is assigned to RDC domain 1, and ARM Cortex-A core and other bus masters use the default assignment (RDC domain 0). Every example/demo has its specific RDC setting in its board.c (see BOARD_RdcInit() function). The user of this package can remove or change the RDC settings in the example/demo or in his application. It is recommended to limit the access of a peripheral to the only core using it when possible. The memory declaration is also modified in the device tree above in order to reserve some areas for FreeRTOS and/or shared memory. The Remote Processor Messaging (RPMsg) is a virtio-based messaging bus that allows Inter Processor Communications (IPC) between independent software contexts running on homogeneous or heterogeneous cores present in an Asymmetric Multi Processing (AMP) system. The RPMsg API is compliant with the RPMsg bus infrastructure present in upstream Linux 3.4.x kernel onward. Note that the DDR is used by default in RPMsg to exchange messages between cores. In order to build the FreeRTOS BSP, you first need to download and install a toolchain for ARM Cortex-M processors. The FreeRTOS SDK v2.3 is available from our GitHub freertos-boundary repository. Finally, you need to export the ARMGCC_DIR variable so FreeRTOS knows your toolchain location. You can then copy that hello_world.bin firmware to the root of the eMMC or any other storage you use. By default, the firmware is loaded from eMMC to TCM. Before going any further, make sure to hook up the second serial port to your machine as the one marked as “console” will be used for U-Boot and the other one will display data coming from the MCU. In order to start the MCU automatically at boot up, we need to set a variable that will tell the boot.scr to load the firmware. To do so, make sure to save this variable. The Hello World project is a simple demonstration program that uses the BSP software. It prints the “Hello World” message to the ARM Cortex-M4 terminal using the BSP UART drivers. The purpose of this demo is to show how to use the UART and to provide a simple project for debugging and further development. You can then type anything in that terminal, it will be echoed back to the serial port as you can see in the source code. This demo application demonstrates the RPMsg remote peer stack. It works with Linux RPMsg master peer to transfer string content back and forth. The Linux driver creates a tty node to which you can write to. The MCU displays what is received, and echoes back the same message as an acknowledgement. The tty reader on ARM Cortex-A core can get the message, and start another transaction. The demo demonstrates RPMsg’s ability to send arbitrary content back and forth. Once Linux has booted up, you need to load the RPMsg module so the communication between the two cores can start. The last command above writes into the tty node, which means that the Cortex-M4 should have received data as it can be seen on the second serial port. Same as previous demo, this one demonstrates the RPMsg communication. After the communication channels are created, Linux OS transfers the first integer to FreeRTOS OS. The receiving peer adds 1 to the integer and transfers it back, a hundred times and then stops. [   30.734104] imx_rpmsg_pingpong virtio0.rpmsg-openamp-demo-channel.-1.30: goodbye! While you can send the received data from the MCU on the main serial port, you can also see the data received from the MPU on the secondary serial port.